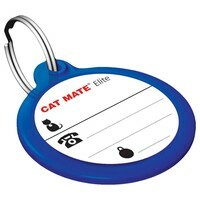 Cat Mate Elite Electronic ID Disc is an additional tag for use with the Elite Super Selective and Elite Selective cat flaps from Cat Mate. Working by a radio frequency signal, these ID discs are essential components as they are basically the cat's access in and out of the flap. Each cat using the flap requires its own unique disc.